Sky Watch Friday was started by sweet idea from Dot 3 years ago, with the simple concept of appreciating the view up in the sky. It can be an entertaining show, always something different and best of all free to all. Collecting hundreds of friends along the way Sky Watch continues to grow and sure makes my week. Thank you to our kind hosts and bloggers who participate every week. Another weekly visit & birthday is Christina’s Soul Aperture where she too celebrates the simple joys in life. Have a great weekend everyone and remember it is a crazy old world out there sometimes, all the more reason to celebrate all that is simply good. 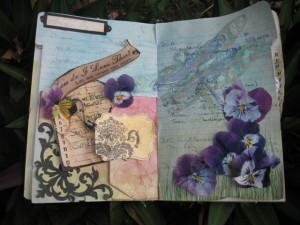 For me, simple pleasures include art journals using colourful glimmer mists for glittering accents and trims. This one is part of a challenge going on at Gall Creative & Scrapping Outback, with lots or prizes to win over there this week. Great shot! And wonderful quote to go with it. I also like what you wrote about skywatch. I started blogging to participate in Skywatch. A beautiful scene bathed in gentle light and calming colours. Spectacular view. The colors, reflections are just perfect. Dear Mandy, a walk on the beach to watch the sunrise, is one of the pleasures. Happy SWF. 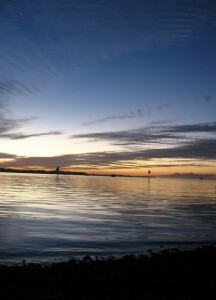 How very calming the sky reflections are in the water!<br /><br />Happy SkyWatch Birthday. 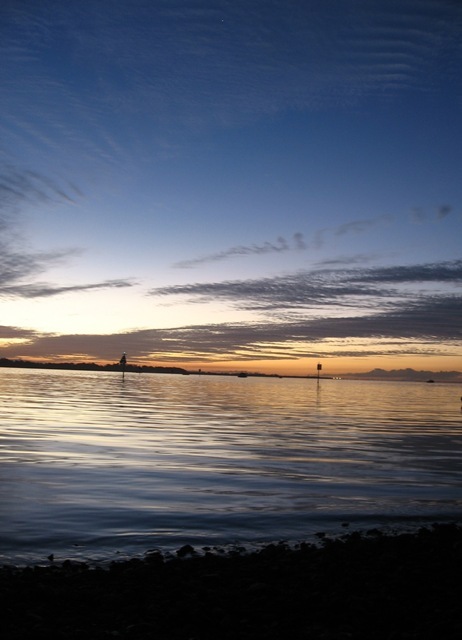 Lovely capture, – the line of the horizon creates such a beautiful contrast to sky and water. Great quote, Mandy! And perfect for this lovely photo. Happy new template. <br /><br />Lovely image. Great shot and lovely quote. Love it. Great Sky watch shot…and the water reflections just enhance it..well done !! beautiful sky! thanks for your thoughtful words. Oh this makes me miss being near the water. Great shot! beautiful scene, here.<br />thanks so much for joining us.<br /><br />one love. Nice blue sky with the clouds blowing. Extremely beautiful shot. Enjoyed it. We have been having some beautiful winter calm sunsets of late here in Australia. This one looks just like it! Nice quotes for a beautiful sky photo. Have a nice weekend. Oh, Mandy. I love your list. And I really, really love your journal pages. They inspire me and make me happy. What a talent you have.